Take a shot at archery! 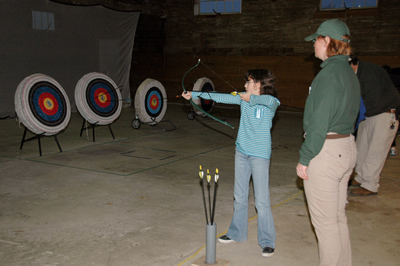 Stop in anytime during open shoot archery to improve your archery skills at our indoor range. This is not an instructional clinic and is designed for those already familiar with archery techniques. All equipment is provided. Please dress for the weather as the Activity Barn is not heated or air conditioned. The cost is $10 per person; cash or check only. Sunday, May 19 from 10 a.m.-2 p.m.
For more information, please call 732-842-4000, ext. 4236, or email douglas.kalucki@monmouthcountyparks.com.